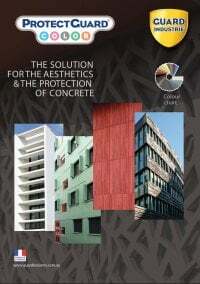 Pro Seal 896 is a revolutionary new water based concrete sealer that overcomes some of the biggest challenges in the concrete sealing industry without compromising on quality. Dollar for dollar it is the best quality sealer we have seen, by a fair margin. It is so versatile it can be used to seal most types of porous surfaces in almost any application. 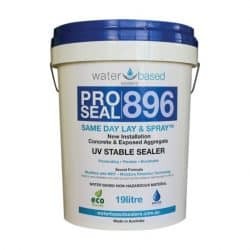 Pro Seal 896 is a water-based cross linking acrylic copolymer paving & concrete sealer that is applied against a hydro barrier (wet substrate) and dries to a clear natural to semi-gloss finish. It is flexible, durable, breathable, UV stable and cost effective. Both the 4L bottles and 19L tubs come in a concentrated form - reducing the amount of packaging used, cost of freight and the amount of space needed for storage. Pro Seal 896 must be diluted with water at a 1:4 ratio prior to application. Q. 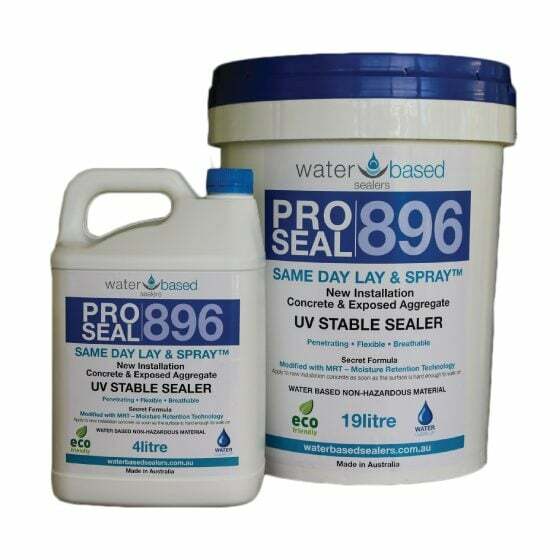 WHAT MAKES PRO SEAL 896 CONCRETE SEALER SO SPECIAL? A. 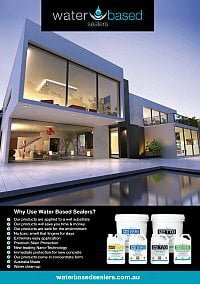 Besides the fact that this premium quality water based sealer is a very reasonable price, THE SINGLE MOST IMPORTANT FEATURE OF THIS PRODUCT IS THAT IT IS DESIGNED TO BE APPLIED TO WET SURFACES! 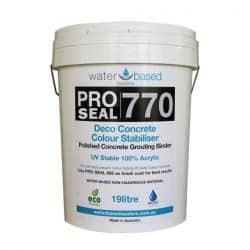 Anyone who has applied a concrete sealer knows that you need the surface to be as dry as possible so that the sealer will be drawn into the surface and thereby bind to surface strongly and consistently. In the case of most solvent based sealers any moisture remaining in the substrate will cause the sealer to haze. For freshly poured surfaces this often means waiting up to a month before a decent sealer can be applied. 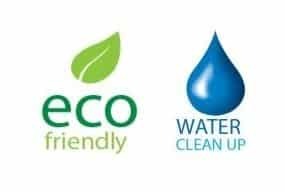 For surfaces that need to be pressure cleaned prior to sealing you will normally need to wait at least a day for the surface to dry out sufficiently. This waiting can turn even a relatively small job into at least a 2 day event. For contractors this means a return trip a day or two later to apply a sealer. Worse still, all the time you are waiting for the surface to dry, is time that the clean surface is at risk of getting dirty again. Safe and Easy to apply. Non toxic, No VOC's & BPA Free. Clean and Seal the SAME DAY - applied to wet surface. Apply sealer throughout the winter months without fear. One coat sufficient in most cases. A second coat can normally be applied within 30 minutes. Seal concrete as soon as it is firm enough to walk on. Exposed aggregate concrete can be sealed immediately after exposing the aggregate – No Need for Acid Washing. 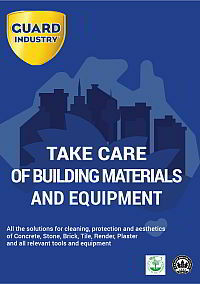 Concrete sealer doubles as a curing agent for new concrete. 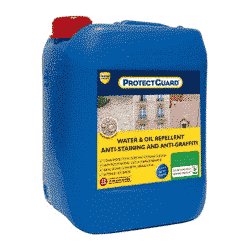 Concentrated formula – carry enough product to seal up to 450m2 in just one 19L container. 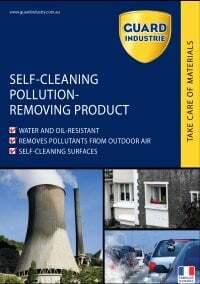 Contains no VOCs = healthy choice for your family and pets. High quality, extreme durability and long lasting protection. Excellent stain resistance and water repellency. Does not significantly alter the appearance of concrete, limestone or pavers. Will not make surfaces more slippery when wet. Minimal disruption – get the job done in a day.